Shipping is typically via USPS and usually within 3 days of receiving the order. Shipping outside the contiguous US is $14.95 for up to three levers. Call or write to us for pricing on more than three levers. Once your order is ready to ship, delivery time is typically one to seven days, depending on distance from our facility. All Switchview USATM scope magnification adjustment levers are warranted to be free from manufacturer defects for a period of 12 months from date of purchase. The SwitchviewTM is designed with a “breakaway” feature so the scope isn’t damaged if the lever is hit with excessive force. We will replace levers broken this way one time only for $40 plus shipping and handling. If a customer orders a product in err, it can be returned to us at their cost for a full refund minus a $15 handling fee as long as the product has not been altered or damaged. If the fault falls on Switchview, or for warranty issues, we will issue a return authorization (RMA) for the product and immediately replace the lever at no charge. What measurements do I need to find the Swtichview to fit my scope? 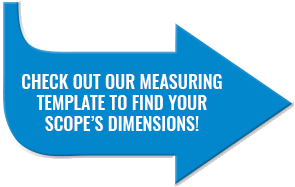 Check out our scope measuring template below to see which measurements are necessary to find the best Switchview for your application. We recommend using a set of digital calipers to get the most accurate measurement possible.